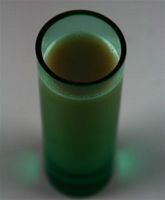 The B-53 is one of the popular coffee liquor shot drinks that is part of a collective known as the B-50 family. While it's counterpart, the B-52 is decidedly more well-known, the B-53 is a fun variation that can be made in a variety of ways. Every one of the B-50 shots consists of three liqueurs that are layered to create a spectacular looking drink. The key to getting great layers is two-fold: pour the ingredients in the order given because the heaviest liquid needs to be on the bottom and break up the flow of the liquor by using a classic bartending technique called 'floating.' Don't worry, it's very easy, and the B-53 is the perfect opportunity to practice your skills. While the coffee and Irish cream liqueurs are standard in every B-50 shot, the B-53 stands out because it includes sambuca. This is a popular anise-flavored liqueur, and you might know the taste better as that of black licorice. Granted, it is not a flavor that everyone enjoys, but you'll be pleasantly surprised at how the other ingredients tame it down. Pour the coffee liqueur into a shot glass, filling 1/3 of the glass. Float an equal amount of the Irish cream over the coffee liqueur by pouring it over the back of a spoon. Float the sambuca on top using the same spoon technique to finish off the shot. Alternatively, shake the three ingredients in a cocktail shaker filled with ice and strain into a shot glass. As with many shooter recipes, the B-53 has been remade and adapted a few times over the years. At least one of these recipes took out the anise flavor completely, and it honestly doesn't work as well. All of these shots are layered in the same manner as above, pouring equal amounts of each spirit in the order given. The coffee and Irish cream liqueurs. Kahlua and Bailey's may be the most popular coffee and Irish cream liqueurs on the market, but they're not the only options. They're also not required to make a great B-53 shot. If you prefer a different brand, feel free to use it. You might also try your luck at making your own liqueurs (both are very easy). Sambuca comes in many colors. The fun part about sambuca is that you can get the same great anise flavor, but choose your color. This is perfect for a shot like the B-53 where each liqueur is showcased in layers. White sambuca is the most common, and it is actually a clear liquid. Many brands produce it, and Molinari is a favorite. Red sambuca has a brilliant, deep crimson color. It is more difficult to find, but it's possible. Zambello Sambuca Rossa is a nice option. Black sambuca is actually a deep blue or purple color (it's the nature of transparent liquids), and it's a great way to top off the B-53. There are a number of brands that make it, including Romana, Galliano, and Luxardo (Passione Nera). If you opt for absinthe, it may be tempting to shoot straight absinthe after cracking open the bottle and enjoying a B-53 or two. It's really not a good idea because both the taste and liquor are very strong and any responsible drinker should not recommend it. Instead, do the 'absinthe ritual.' It's a cool effect and tastes much better.